"It's been 10 years since his debut, Ziggy Stardust and the Spiders From Mars, and David Bowie continues to cling to variations on his Ziggy persona, releasing sub par facsimiles of that record for much of the last decade. Years back he had planned a trip to Berlin for creative inspiration and time out of the spotlight, but that trip was cancelled after a trip of a different kind: shattering his collarbone in three places after falling off a pair of stilts while filming the video for his cover of T. Rex's "Metal Guru", a video which has since garnered consistent airplay on the new 24-hour cable music video channel, MTV. His new best-of album Starman: The Best Of hits shops next week." Fast-forward this parallel universe to the present day: David Bowie would have one great album, and hold no musical or cultural relevance, with only a sprinkling of reverence among only the most fervent of fans. In other words, he would be standing way ahead of Brian Warner. Marilyn Manson is rich and famous, a great entertainer and one of the most interesting rock personalities of the last decade, but none of those entertaining or interesting qualities ever came through in his music, and if they did, they were far from cohesive. 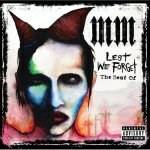 Listening to Lest We Forget you can't help but feel that unlike his idol -- and similar to the farcical career trajectory lampooned above -- Manson compromised, reprising his fright-night imagery with each CD release while continuously dumbing-down his music to keep from falling off the main stage. Either that or his iconic image and loquacious wit were the only real selling points all along. It seems only fitting that ten years removed from "Sweet Dreams", Marilyn Manson finds himself a product of diminishing returns. Another Manson song that benefited from the creepiest of creepy videos was "The Beautiful People", from 1996's Anti-Christ Superstar. Sure, this one contains a buzzsaw riff and a shouty chorus, but it's one great buzzsaw riff, and unlike many of Manson's songs, the chorus doesn't feel tacked on. Follow-up Mechanical Animals found Manson at his most commercial and accessible, yet it's represented here only by "The Dope Show" and the aforementioned "Rock Is Dead" (No "I Don't Like the Drugs (But the Drugs Like Me)"?). Here, Manson gets his glammed-up goth groove on, incorporating female vocalists and a wider sonic palette before he would regress back to safer sonic pastures. Surprisingly, a track like "The Dope Show" hasn't aged well at all; it's as if this particular song is barren without the visual aid of a nymph-like Manson alien -- fire red hair, white-skinned and genitalia-challenged -- stalking the camera through a wheat field, as he did in the video clip for that song. 2003's The Golden Age of the Grotesque featured "mOBSCENE" and is the best thing on this best-of. The song has ferocious giddy-up, complete with a cheer from a group of high school cheerleaders. Here Manson finds the little bit of irreverence he is looking for. Tim Skold, who co-produced this track and the rest of TGAOTG with Manson, represents his best production partner without the last name Reznor. Manson would be wise to continue to employ his services if and when he decides to make another record. But that is really it. A few choice hits on a far too lengthy and same-sounding best-of. The inside of the fold-out CD booklet contains 29 pictures of Manson, charting his various personas throughout the years. If your memory is good or allows you to, you can picture Manson in one of those guises, giving Carson Daly a great interview on Total Request Live, or on stage at the VMAs giving America a shock in an assless leotard. This is what made Manson great for a time, in spite of his music, which never tried as hard.